This comic heated up a couple of years ago, probably due to speculation, and after a recent tweet by Ben Afflek, you can expect to see it heat up even more. It was just yesterday morning that Afflek posted a short video of Deathstroke. It looks like it could be a costume and lighting test, so it seems highly probable that we'll be seeing him on the big screen sometime in the future. It's being speculated that he will be the main villain in the solo Batman film which will be directed by Afflek himself, and he will be playing the titular character as well. I'm not going to get into a lot of detail or rumors of this news, there are plenty of sites out there that are already doing that. 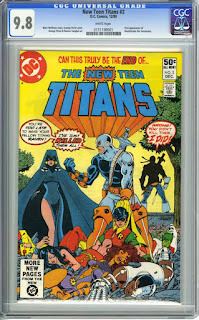 I'd much rather talk about the comic that has the first appearance of Deathstroke. Deathstroke's real name is Slade Wilson, and he is gun for hire assassin. He's of no relation to Wade Wilson (Deadpool), but Wade was given that name as an inside joke because of the similarities between the two characters. Anyway, if you want to learn a little more about Wade Wilson, check out my post on New Mutants #98. Ok, let's get back to this issue. In the first few pages of The New Teen Titans #2, Deathstroke was summoned by H.I.V.E. to take out the newly formed Teen Titans team. However, they don't come to terms on a deal and Deathstroke declines. While he was there, H.I.V.E. uses a bunch of sciency gizmos to take readings of good ol' Slade. H.I.V.E. uses the information they gathered to make another version of Deathstroke the Terminator. What H.I.V.E. did was take Grant Wilson, and give him the same powers that Deathstroke has, but more powerful versions of them. Now that Grant has these extraordinary powers, he takes up the handle of Ravager and takes the place of Slade Wilson to seek out and destroy the Teen Titans. There is a down side to these new powers. The more he uses them, the more life energy is sucked from him, and during the battle with the Titans, he uses too much and ends up dying. If you're wondering if Slade and Grant Wilson are related because they also have the same last name, then the answer is yes. Grant is Slade Wilson's son, but he's unaware of it. It's not really discussed what the group known as H.I.V.E. is in this issue. H.I.V.E is an acronym for Hierarchy of International Vengeance and Extermination and what they want is simple. They want to eliminate superheroes and take over the world. Just to cover the key issue notes, the character of W.R. Wintergreen is Slade Wilson's manservant, kinda like Alfred is to Batman, and because of his military background, was a mentor to Slade Wilson. The late Bronze Age saw a lot of comics being printed if rather large numbers, so there are plenty of copies of this comic to be found wherever you look, and chances are you'll be able to find a high grade copy. The CGC census numbers show that most of the copies already graded by them are high grade. Of the 2,289 copies listed, over 1,600 are graded 9.0 VF/NM or better. 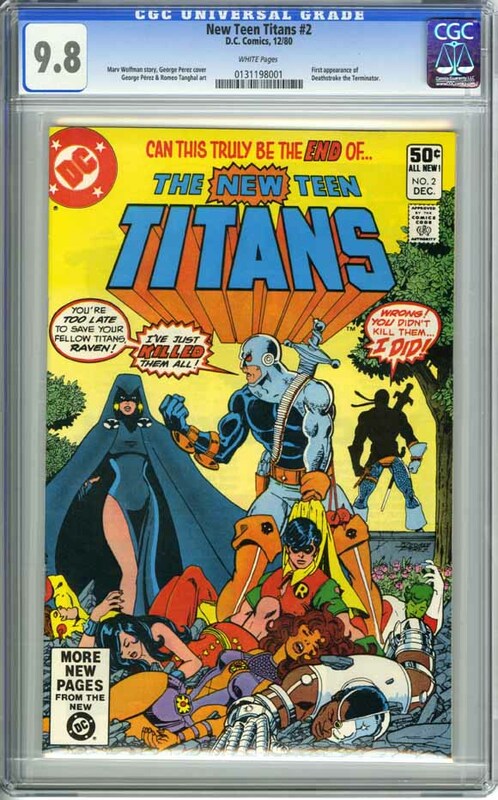 There is one lone copy that has been graded a exceptional 9.9 Mint. There aren't any sales records for that copy, so let's check out the sales for 9.8 NM/M. I mentioned earlier that this comic heated up a couple of years ago. In 2011, you could snag a 9.8 NM/M copy of this comic for a little more that $150. In early 2013, that number more than doubled and we started to see prices reach the low $300 mark and even passed $400 once. Since then, there have been sales up over the $600 mark here and there but has now settled a little more than the $500 range. If you look at the line graph in the chart to the left, you can see that big surge in value and it's kinda sustained. If you can't afford a 9.8 NM/M copy, then perhaps a 9.6 MN+ would be better. You may still be able to pick up a copy for less than $200, and a 9.4 NM for even cheaper, if you're lucky. I have no idea what will happen to the values after the movie comes out, but I do expect to see another boost in value as time goes on and the role is finally cast. If you're looking for a speculation book to get and try to flip it in a few months, this could be a nice pick-up for you. Or, if you're holding on to that 9.9 M copy, you might want to throw that on the market and laugh all the way to the bank.